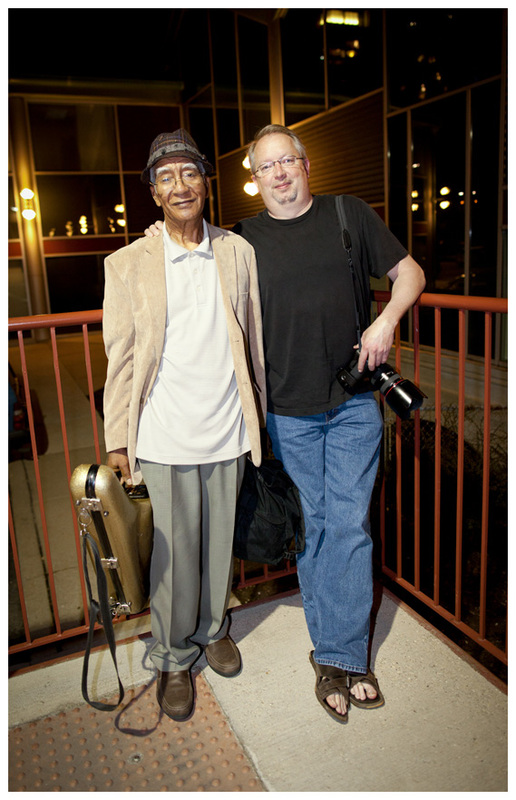 This is a photograph of me and friend Edward “Kidd” Jordan, taken out back of the Jazz Showcase in Chicago this year, a month or so before his 77th Birthday. Kidd was in Chicago for the 2nd Annual “Brotherhood of Fred” show, paying well deserved respect to the late, great Fred Anderson. Kidd is originally from Crowley, Louisiana and is currently back in his home in New Orleans (watch for his guest spot on the HBO series “Treme” as well), after being displaced for many years by hurricane Katrina. I met Kidd several years ago on one of his frequent trips to Chicago. He was very close to Fred Anderson, another great tenor player and for some time, it was rare to see one without the other. Kidd would be in town to play nightly “after-sets” at Fred’s Velvet Lounge, during the Chicago Jazz Fest. These after-sets would become legendary before Fred’s untimely death in June of 2010. I was actually in NYC to photograph the Vision Festival, where Fred (and Kidd) were scheduled to play when I got word of Fred’s death. I was actually speaking with Kidd at the time I received the call. Fred had fallen ill a few weeks before and while we all held out hope Fred would recover, it just wasn’t to be. That evening, pianist Richard Muhal Abrams dedicated his solo performance to Fred. Kidd has played with so many other legendary players including Ray Charles, Stevie Wonder, Aretha Franklin, Ornette Coleman, Henry Grimes, Cecil Taylor, Canonball Adderley…really too many to list but you get the idea. Kidd was also given the Vision Festival’s Lifetime Recognition Award in 2008, well deserved and I was happy to be there for it. I recall that particular night being in a very small venue on the lower-eastside with no air-condition..during the middle of a heatwave in NYC…. To say Kidd is a wonderful person would be an understatement and I take every opportunity to see him when I can! This photograph was made by another friend, John Broughton. You are currently browsing the No Room For Squares blog archives for April, 2012.